Rumor around campus is that Cecil Whiteside may have been “dismissed” from the team because of academic issues. However, it seems like he can still rejoin the team if he can improve his grades by the end of summer. Cal may be deep at outside linebacker, but Whiteside is a stellar player and will only make the defense better. Let’s hope Whiteside is getting help from as many tutors as possible, maybe we can even pitch in by helping him write some cheat sheets (just a thought). 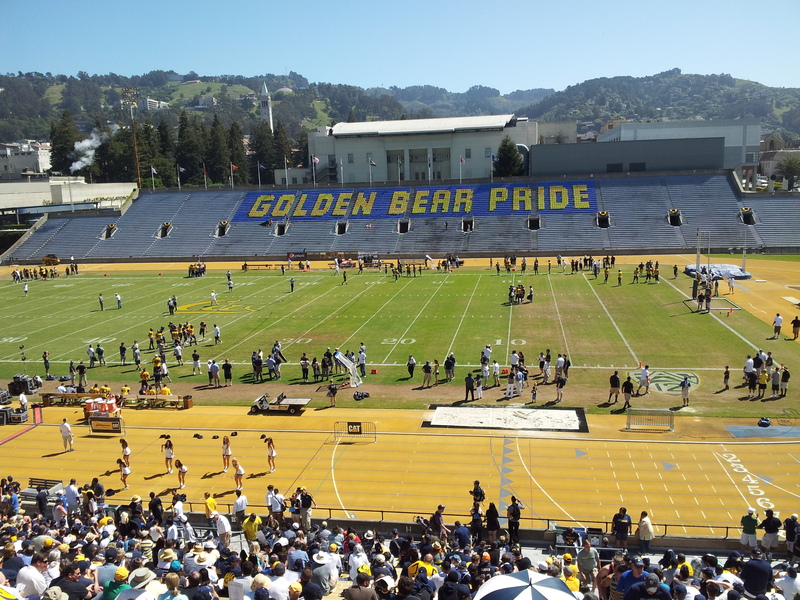 BERKELEY – Sophomore linebacker Cecil Whiteside has been dismissed from the Cal football team for a violation of team rules, head coach Jeff Tedford announced on Thursday. No details yet on what exactly happened. This is a very unfortunate event, as Whiteside showed good potential last season as an outside linebacker when he made key plays for the team throughout the season. Here is the PDF to Cal’s Depth Chart. Also here is a very good general analysis from California Golden Blogs. I won’t go into too much detail with the depth chart just things that pop out and also potential changes come fall. Currently the coaching staff have not written in the backups for Harris and Allen. This means that we will see a lot of competition among the incoming freshman and the current batch of receivers. Look for incoming freshman Bryce Treggs to make a splash this fall. The biggest change here is that Brian Schwenke is moving from guard to center while Galas moves to right guard. Schwenke did enough as center this spring to show that he can play that position; however, there were a few times where he botched some shotgun snaps (it’s apparently Cal’s Achilles Heal). It will be very interesting to see how redshirt freshman Jordan Rigsbee plays come game day, as he is the only non-senior starting offensive lineman. It is also disappointing to see that former touted recruit Matt Williams is nowhere to be seen on the depth chart. Obvious 1-2 here, though it will be interesting who will be Cal’s third string QB. Boehm? Hinder? Kline? Eric Stevens is the obvious pick for starting fullback as he was slated to start last season until his season ending injury. Interesting that Kameron Krebs is the backup even though Dasarte Yarnway made a big showing this spring as a capable fullback/halfback. The tailback 1-2 hasn’t changed, nor should it. I do think though that both Bigelow and Lasco will have their fair share of snaps. No one should be surprised that Deandre Coleman and Mustafa Jalil are starters. Even though Payne is placed as the starter for nose guard above Tipoti, I think Tipoti will eventually get more snaps than Payne. It is disappointing that both Gabe King and Vei Moala is not on the depth chart. One good surprise is that Todd Barr is backing up for Coleman. Barr is a big athlete and will very likely receive a good number of snaps during games. The outside linebacker depth will most likely stay the same after fall camp. However, at inside linebacker I don’t think Mullins will keep his starting job. Instead, Wilkerson and Forbes are more likely to be the starting two inside as long as Wilkerson can stay healthy. It would be best for Cal to have Wilkerson on the field either at inside or outside, as long as he is on the field. Even though Jason Gibson had a strong showing in Spring Camp, it doesn’t look like he is good enough to be a backup. Gibson has the speed but coaches may want him to bulk up and learn the plays better. No surprises here with Anthony and Williams starting again, with Stefan McClure behind them. I’m also not surprised that Kameron Jackson has beaten out the other cornerbacks for the other backup spot, he had a solid spring and deserves to be there. Cole Leininger at Punter and Vince D’Amato at Placekicker/Kickoff – this will most likely be the starters throughout the 2012 season. Once again Brandon Madueno will be the snapper (Madueno took over for Matt Rios after Rios was kicked off the team for supposedly academic reasons). Cal’s new holder will be receiver Jackson Bouza, who has been practicing as the starting holder all throughout the Spring and will most likely will be the holder during the regular season. It will be interesting to see Keenan Allen as a punt returner, but I don’t see him as too much of an improvement over Marvin Jones. Maybe an incoming freshman might take the job. At kick returner is Bigelow and Manuel; no surprises here. Let’s hope Bigelow can show us some big play moves now that his braces are off.